Community Description: These partial canopy woodlands (usually less than 50% cover) support red spruce, mixed with lesser amounts of other conifers, birches, red oak, or beech. Vegetation tends to be very patchy due to the substrate and may include large expanses with little to no vascular vegetation. Beneath the scattered trees and smaller, sapling sized trees, heath shrubs or herbs are found in pockets (15-45% cover overall). Typical species include lowbush blueberry, common polypody, rusty cliff fern, and crinkled hairgrass. Bryoids may include typical forest species in areas where the tree canopy is fairly well developed; in more open areas, rock-tripe lichens and patches of reindeer lichens are characteristic. Back to top. Soil and Site Characteristics: Sites occur on talus slopes, with vegetation developing in patches among the rocks. Sites are usually steep (>20% slope), have very limited soil, and are typically on acidic rocks such as granite. Back to top. Diagnostics: These are open canopy woodlands or barren talus slopes in which red spruce is dominant. Back to top. Similar Types: Spruce - Pine Woodlands have similar canopies but occur on bedrock versus talus and have more heaths and fewer ferns and rock tripe lichens. 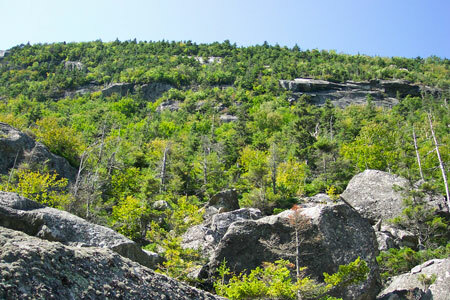 Other talus woodlands (Birch - Oak Rocky Woodlands and Oak - Ash Woodlands) are dominated by deciduous trees, not conifers. Large talus slopes at high elevations habitats (e.g., Mt. Abram) will likely be classified as one of the alpine or sub-alpine types. Back to top. Conservation, Wildlife and Management Considerations: Most sites have little potential economic use. Sites are generally small and embedded within a coniferous or mixed forest hill slope. The cool, moist crevices in these talus slopes provide excellent habitat for the rock vole and long-tailed shrew. This community may also host the Gaspé shrew, a species not currently known from Maine that occurs just to the north in Canada. Back to top. Distribution: New England - Adirondack Province and Laurentian Mixed Forest Province, extending westward (and probably eastward and northward) from Maine. Landscape Pattern: Small Patch. Back to top. There are no documented examples of rare plants associated with this natural community. There are no documented examples of rare animals associated with this natural community. Deboullie Ponds Public Lands Aroostook Co.